For the delicate skin of newborns and infants. Since they contain emollients, the wipes oil and moisturise the skin, protecting it against irritation and drying out. 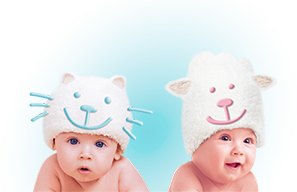 They gently and efficiently cleanse your baby's skin, leaving it smooth, soft and delicate. They have a subtle, refreshing scent. They are hypoallergenic, dermatologically tested, and alcohol-, PEG- and paraben-free. For sensitive and atopic skin. They gently moisturise the skin and protect it against baby rash and irritation. They contain panthenol, which is known to support the skin healing process, and chlorhexidine, considered to have antiseptic properties. They create a special barrier that protects the skin against harmful external factors. They are hypoallergenic, dermatologically tested, and alcohol-, PEG-, paraben- and fragrance-free. Wet wipes for normal skin. They contain almond oil, a natural emollient that moisturises and firms the skin, as well as Vitamin E that has an anti-inflammatory and regenerating effect on the epidermis. The wipes gently and efficiently cleanse the skin of your baby, protecting it against irritation. They have a delicate and refreshing scent. They are hypoallergenic, dermatologically tested, and alcohol-, PEG- and paraben-free. 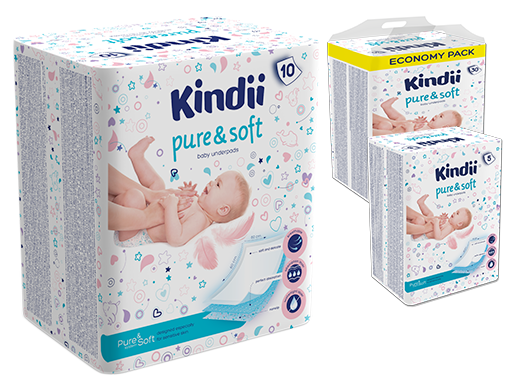 Kindii Pure wipes are a modern product with a limited number of ingredients created for exceptionally gentle cleansing and care of sensitive skin of infants and babies from the first day of life. Specially developed, fragrance free recipe, contains ingredients of natural origin. Aloe vera, known for moisturizing and regenerating irritated skin. The natural emollient Glyceryl Oleate protects the skin against the negative influence of external factors, prevents dehydration and strengthens the protective lipid barrier. 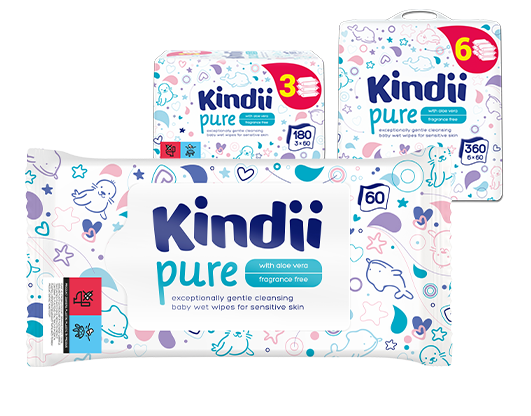 A delicate and soft wipes cleans effectively. 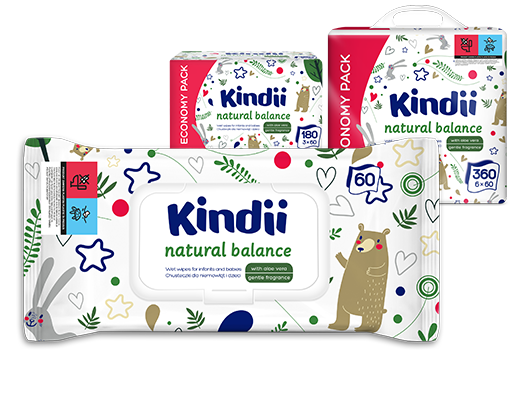 The packaging contains 60 wet wipes, the product is also available in consumer-friendly multi-packs. They facilitate care with water, baby oil, cream or powder. 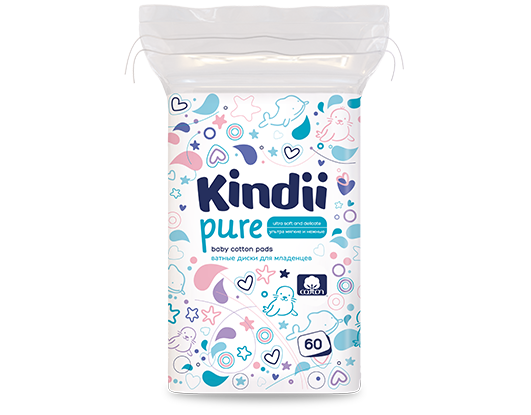 Recommended for daily washing and drying of your baby's face, body, groin and pleated skin. 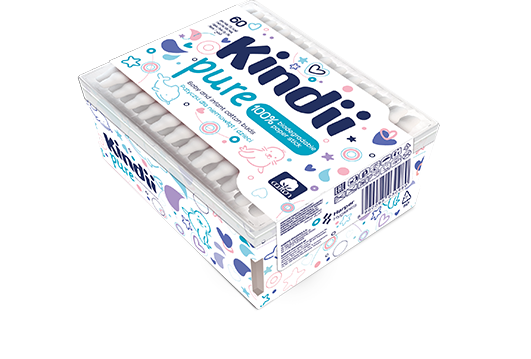 100% pure cotton, gentle edges, lint-free. Extremely gentle buds, with a special head for increased safety and comfort of use. Perfect for cleaning eyes, ears, nose and the navel. 100% pure cotton.